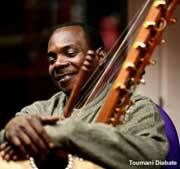 Toumani Diabaté comes from a long line of Malian kora players, the kora being a 21-string harp crafted from a halved calabash gourd and cow skin, with nylon strings. This is only his second solo album from a large discography – the first one was in 1988. 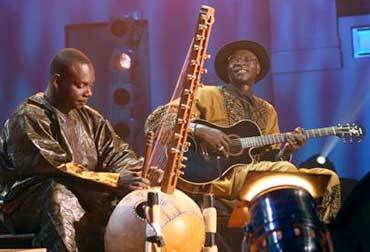 He has however recorded duet albums, like the lyrical New Ancient Strings with another talented kora player Ballake Cissoko and more recently a gently mesmerising In The Heart of The Moon, with the late Ali Farka Toure. He then assembled the enormous Symmetric Orchestra to record Boulevard de L'independence, a funky but somewhat noisy dance extravaganza where his usual subtlety was set aside. Now he comes full circle back to his roots with a fascinating and gorgeous Mande Variations for solo kora (albeit with a few overdubs), a suite of original compositions, including a tribute to Ali Farka Toure. This is true griot-based music (despite the brief allusion to the Good the Bad & the Ugly at one point), but don’t think because he plays a primitive instrument the music is likewise. It is sophisticated, elaborate music – perhaps the sound equivalent of the most exquisite Berber carpet – washing over the listener with lush melodies and rhythms that are expanded with extraordinarily virtuosic improvisations. He is certainly at his brilliant best here - clear, confident, subtle and mesmerising, confirming once again his place as one of the masters of this beautiful and distinctive instrument.